Heritage Homecare is a home health care agency providing services including skilled nursing, home health aides, physical therapy, speech therapy, occupational therapy, and social services. We serve all of Broward County in the South Florida area. Our Company is founded on a history of caring for others. The owners of Heritage Homecare have years of experience caring for people. It's our heritage. Our mission is to provide the highest quality of care and service to our clients. Our goal is to make every client feel as if he or she is our only client. 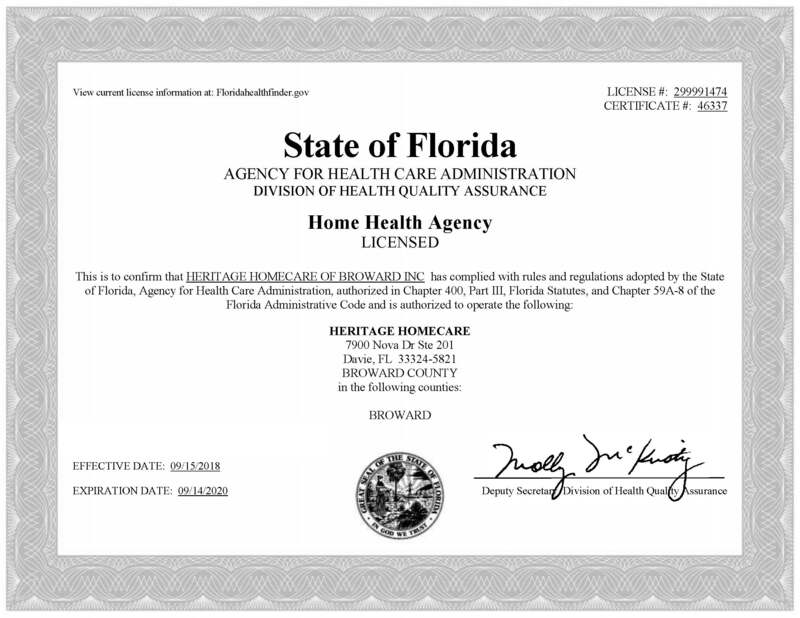 Heritage Homecare is completely family owned and operated. Home health care agencies are a vast resource for persons in need of assistance in the home. A wide array of services can be performed in the home allowing individuals the familiar surroundings of their home when an individual or family member is in need of specialized treatment, personal care assistance or ancillary services that would otherwise require a trip to a doctor's office or other medical care center. Please look around and feel free to contact us to answer any questions or concerns that you might have. Click here to see if you qualify for free home care under Medicare? The Heritage Homecare logo is a registered trade mark.